Uglyworld #707 - Out In The Wilderness, originally uploaded by www.bazpics.com. When I told the gang this morning that we were heading out into the wilderness today they were a little taken aback as to what exactly this meant. When we stopped at the town of Sisters on our way to Bend, Babo jumped out of the car in an effort to make the rest of the guys more at ease, "Looks, this is the wildernesses, that means grasses, fields, mountains and other cool stuffs like this!". 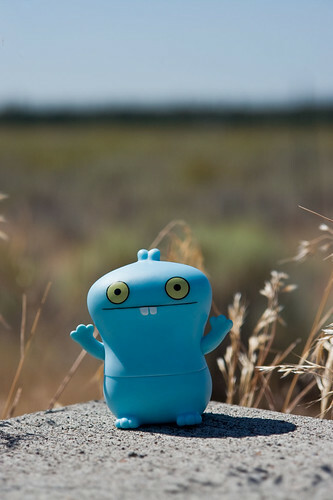 The rest of the gang seemed to believe Babo and the fun of being off on another road trip kicked in good and proper.